Last week, Wilfrid Laurier University announced that mStoner was the firm selected to design the public face of the university’s new website. 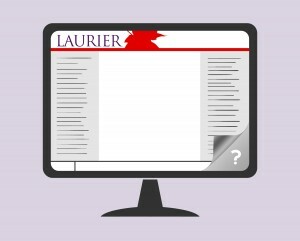 mStoner assisted Laurier in 2012 with the first phase of the university’s renewal process. “They were, by far, the most qualified firm that came to the table with the right experience,” said Helen Exley, associate director of marketing and creative services at Laurier. Last week, mStoner was on campus working with focus groups to better understand the needs and wants of the Laurier community towards the new site. They are currently in the strategy phase, planning out the site’s navigation based on feedback. Plans for the website include a more responsive and accessible design that will make navigating around the website much easier for its users. This includes making it responsive to the device that is making the request and ensuring that the users with visual impairments and other types of restrictions are able to navigate and find what they are looking for. “There are some industry standards we have to meet, but we also want to go with an open slate, where if you land on the main page you have a very good idea where to go next to find what is most relevant,” said Buckley. The overall goal of the renewal is trying to modernize WLU’s website. “It is about trying to build something that reflects who we are that does justice to us as an academy,” said Buckley. “Most evidently our website is old and outdated, and needs a fresh look to represent our visible identity. It needs to be more user-friendly for current and prospective students to use,” said Exley. The website is expected to be released in the fall. The development team is confident it will be completed on time. “We have an aggressive timeline to follow. It’s a high priority for all of us and we hope to stay on track for the full time. We will be regularly communicating to the Laurier community, so everybody will know where we are at each stage,” said Exley. “The community is impatient, as am I; we are long overdue for a website renewal. But before the end of this calendar year, wlu.ca will look more modern and different than it does today,” said Buckley. Moving into the summer, the next phase will see some of the concept prototypes for the website being tested, while auditing the current website’s content and developing the new content in time for the fall. Overall, the feeling for the renewal process is positive. “It’s an exciting project that Laurier is embarking on and we are really excited to be telling the Laurier story, and having that wow factor when people come and look at Laurier’s site,” said Exley.